These Top Quality Table Skirts for Conventions are Professional Banquet Supplies! 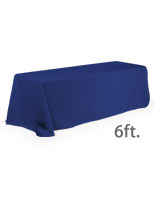 In-Stock Tablecloths and Covers Ship Fast from the On-Site Warehouses! Peruse the Full Selection of Table Skirts to Find Appropriate Solutions! Standard design fits perfectly over a 6-foot rectangular table, covering all (4) sides. Polyester fabric is machine washable and wrinkle resistant. Hunter green cloth easily complements any setting. 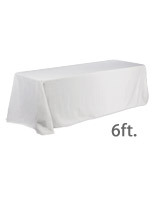 These tablecloths, table skirts are great for either formal or informal occasions. 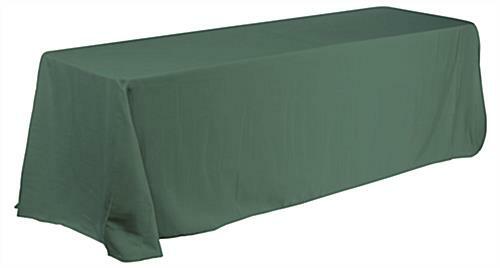 The hunter green fabric allows easily matches other trade show or banquet displays. 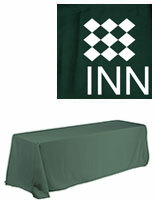 These throws, table skirts are made from 100% polyester fabric to stay looking like new for many events to come. They are also machine-washable and wrinkle resistant for easy maintenance. The table skirts are sewn with rounded corners, and the fabric falls within 1" of the floor on all four sides. 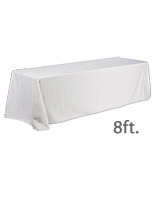 Staff members can make use of the covered area under the bottom of the table to store boxes and accessories. These table skirts, such as tablecloths and linen throws, help create a more professional appearance by simply draping over a table. In just seconds, these covers change unattractive tables into pieces of presentable furniture! Table skirts are great promotional items you can use during a trade show, convention, meeting, fair, or exhibition. Draw the attention of show attendees. 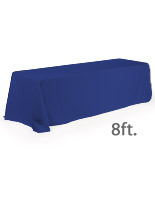 Complete your trade show booth or exhibit display area with these affordable table skirts!